Calling all who wish to move thru the day as your calm, joyful, loving Spirit-Self. To help you live more from the space of Spirit, to live a life filled with more abundance, inner peace, love, ease and JOY! Your Soul is the eternal part of you that is non-physical, Spirit consciousness and energy. It is the greater part of who you are. It’s Love! It’s Joy! It’s ease. It’s perfect health and well-being. It’s an inner calm and knowing. It’s acceptance. It’s the powerful, unlimited source of abundance and all creation! What would it be like to see, hear, feel, sense, think, speak and act more from this greater, unlimited perspective, rather than your smaller, survival, reactive, fear-based self? Would you like to have easy access to that, like simple Doorways to your Soul you can just open and step into? Even if you intellectually believe that you are more than just a physical human being, and that you are a Spiritual Being having a human experience, how much of the time do you actually live from this space, feel it, and experience it’s benefits? How often throughout your day do you react from your survival and fear-based self? For example, do you still worry or feel stressed more than you’d like? Do you feel anxious about your unfulfilled desires? Do you feel great when you meditate, but slip right back out as soon as you re-enter your “reality”? Is this the life you want to perpetuate? What are the potential costs of that? The potential losses? If these experiences occur more than you like, then perhaps it’s time to move beyond just an intellectual understanding, and move towards developing a deeper embodiment of your Spiritual beliefs, to live more fully from your Spirit-Self, your Soul. Learning about your Doorways to the Soul will make this more accessible to you. Einstein said that you cannot solve problems from the same level of consciousness from which they were created (your small self and mind). 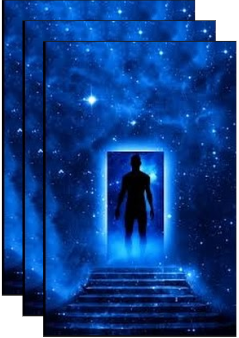 The Doorways to the Soul program will be teaching you how to solve whatever problem you're experiencing from the level of Spirit Consciousness, the most direct and powerful path. For us, this is the ultimate learning of all life’s learning, and the one with the most joy and positive impact in every area of your life. It can feel like the hardest, too! It takes place over time, in layers, as you gradually gain more and more clarity, learn more effective practices, and use them. We also typically have periods of chaos and regression as part of the cycle of growth. (We’ll discuss this in the program.) It’s quite a hero’s journey! So it really helps to have mentors, support and strategies. HOWEVER, even though it can seem challenging, when you learn to hold a higher perspective, it can all be a grand adventure, like the joy of playing a hard sport or game, AND, with the right practices, as well, it can be easier. In the Doorways to your Soul series, you will learn effective strategies for using your body, your emotions, and your language to live more from your higher Spirit perspective, your expanded Self. Instead of getting stuck in emotions that don't feel good, you embrace them as Divine guidance and use them to shift to an empowered state that feels really good! In just 8 weeks of participating in Doorways to the Soul, and learning a new way of being, you can change the trajectory of your future, and have fun in the process of doing so. The group will be very small and personal, with lots of personal attention available for you from Mark and Ann, who are expert coaches. The many perspectives, or presuppositions and beliefs held by Spirit Consciousness/Source Energy. The better you understand these, the easier it is to return to them. We'll also be doing practices to help get them more in your neurology/body. The more limiting beliefs that are running you unconsciously, and how to transform them to the more empowering beliefs of your greater, whole, Spirit-Self. The main focus of the series is to expand your way of being in this way. How to use language that is aligned with your Spirit-Self, and supports creating what you want. Strategies to use when you slip back into “smaller” ways of being, so you can easily step through a doorway to your Soul and be your whole Self again. And, we’ll be doing some meditating every session. So you’re sure to leave feeling good every time, and will learn a good variety of user-friendly, easy meditation strategies. Want to learn more about the series? Come to our free introductory evening on Tuesday, Feb. 19th, 7:00 -8:30 pm, at Roots and Wings Healing Arts Center, 317 N. Main St., Natick, MA. • Learn about the upcoming 8 week Doorways to the Soul series, and get a sense whether this is right for you. This evening will be packed with valuable new information and frameworks to help you on your spiritual path, and is sure to leave you feeling inspired and really, really good! Once you RSVP, we'll be emailing you a preparation handout. Please complete it and bring it with you for an optimal experience. To register for the free intro evening or the 8 week series, or to ask questions, email Ann at annide@newpossibilitiescoaching.com. Remember, once you make the decision and sign up, it already begins to change your future! “I'm enjoying this new underlying sense of stillness and ease (or "harmony!"). I'm discovering a new freedom with respect to others. I feel much less dependent on what others say and do in order to feel good. YAY! I feel like I'm really becoming ME - and that's a huge thing to celebrate.” C.H. "I really appreciate both of you and your joy and enthusiasm. I honor and acknowledge your path to teach. You are great together and inspiring to be with. I really appreciate the explanations and sharing and new ways to think of these things. I have read some of the books and couldn't quite get to the next level; and now I am ready to take that on. Thank you, thank you! S. L.
“I feel excited about my future! I feel empowered and capable. I feel smarter and wiser. I feel confident. I love waking up in the morning and feeling that I get to start a new day all over again! How awesome is that?! In the largest sense, what has opened up for me is my potential. No longer feeling defective, no longer feeling less than everyone else, no longer afraid to express my voice and be seen, I feel as if the world has opened up for me. I see it as my blank palette upon which I am going to create the most magnificent grand finale of life that anyone has seen yet. Before the class I felt as if I had very few choices; now I feel joyfully overwhelmed by the number of choices available." C.M.